When you purchase the am fm radio, this 2-Band radio have long standby time, simple operation, good reception and easy to carry, absolutely your best choice. Whether it is for personal use or as a gift for parents/children. AM/FM Radio with MP3 player support play MP3 format music or other media content TF Card. DSP technology support Superior signal reception capability so you won't miss any radio station. Power by Built-in 500mAh rechargeable lithium battery, Long-time battery for walk, outdoors and sports. Unique ABS body covered with special matte material. Excellent handle and super light weight. Advanced LCD screen can show the time clearly. Use an advanced DSP chip as the radio brain, making the signal analysis and reception ability stronger and channels more stable. Experience your radio in full-bodied stereo realized through dual high-performance drivers. Support 3.5mm interface earphone(included). This compact radio measures only 3.4 x 1.8 x 0.7 inch that it fits neatly into any pocket or handbag, perfect for staying in outdoors or sports. Frequency: FM: 64/87-108 MHz, AM: 520/522-1710 KHz. Power: Built-in 500mAh rechargeable lithium battery. Charge: DC 5V/0.6A, Micro-USB jack. Antenna length: 25mm / 1 in. Size: 88 x 45 x 18mm / 3.4 x 1.8 x 0.7 inch. 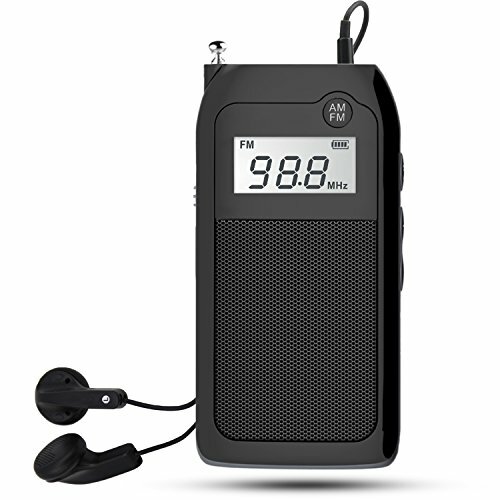 2-Band Digital Radio for Walk: Supports AM and FM broadcasts, FM: 64/87-108 MHz; AM: 520/522-1710 KHz. 9/10KHz AM steps adjustable, 16 levels volume control and built-in 500mAh rechargeable lithium battery. Ideal as a Christmas gift, Birthday gift for adults and kids. AM FM Radio with MP3 player: It can play MP3 music stored in the TF card(Not included) with clear sound. The am fm radio with 2W Speaker, it can make you enjoy your happy radio time with earphone(included). With LCD screen: LCD display back-light to display volume level, frequency, Battery consumption and mode you set or choose, built in AM/FM radio, the display of 2 band radio is easy and clear to read. Easy Operation: With Auto search and store radio stations function, just need to long press "Play/Pause" button to radio auto scan (ATS) funcion. Simple operation program, clear buttons and function indication, the elderly or children also can use it easily. Super Portable: With 3.4 x 1.8 x 0.7 inch and 0.15lb weight size, small and slim. You can put it into your pocket, handbag, backpack or shopping bag easily. It is really a good choice for outdoors, travel, sports and home. View More In Personal Radios. If you have any questions about this product by Luckyu, contact us by completing and submitting the form below. If you are looking for a specif part number, please include it with your message.